I was pleased to attend an on-campus lecture this week presented by Dr. Thomas Rogers. He is an Associate Professor in the College whose interests focus on modern Latin American history—especially Brazil—labor and environmental history, and Afro-Latin American history. 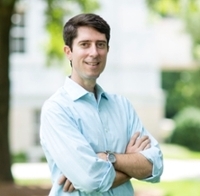 Dr. Rogers is currently working on a book entitled Agriculture’s Energy: Development and Hunger During Brazil’s Ethanol Boom that discusses the advent of agriculture in Brazil, and how that played a role in shaping the country. 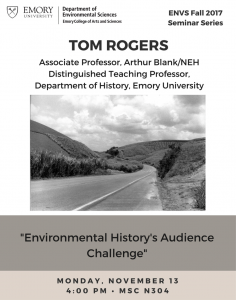 Dr. Rogers’s talk entitled “Environmental History’s Audience Challenge” highlighted some of the key points from his new book, and also sought to address the importance and use of environmental history. I would not describe myself as a history buff by any means, and this talk helped me to see more clearly how important history can be. Around 1975, Brazil experienced its first oil shock, which led to the need for another fuel source. Sugar cane production boomed within a few years, as more and more forests were cut down to grow cane for ethanol production. This development was very rapid, and was an important step in the modernization of Brazil, but it led to an unfortunate outcome. As sugar production increased, so did waste and pollution. One liter of ethanol produces 15 liters of waste, which is equivalent to the daily average waste produced by 7.5 people! Tons of water is used for washing the sugar cane, and for evaporation and distillation of the ethanol. More solid waste comes from all of the husks of the sugar cane, which isn’t used in production. This increase in pollution rates can easily be tracked through newspaper coverage. In the early 1970’s, there was little coverage on pollution, but this increased as sugar cane production made the issue hard to ignore. At one point, half of industrial pollution came from sugar cane production alone. Why is this especially interesting to us? Because of what happened after. While this pattern is not a catchall for what happens during the modernization of agriculture and other industries, it does point us toward interesting patterns of development and responses at all levels of society. What is the use of studying this and other aspects of environmental history? This question reaches further into the future. Dr. Rogers described that the future of history is storytelling. That is, taking lessons from history and composing a narrative that tells a story to anyone willing to read it. People tend to approach history with the perspective that the world is a given and set in stone, but with history as a form of story telling this apprehension can be transformed into a thoughtful understanding of the world as made. These lessons of history can be applied to policy, especially when considering the consciousness of the public-at-large, or when considering who may be an expert on recent issues. These lessons are also important for students, because in many ways historians = teachers.